I am often asked by both students and colleagues about my strategies and tools for time management. In managing a large and diverse portfolio of complex activities over many years I have developed some simple tools and techniques which seem to work. Here are my four top tips to avoid stress and make good use of your time. But firstly something about time and money. Firstly it is important to understand that your time is valuable and any time spent on a task, once used, is gone forever. What is the value of you time? As a bench-mark if you are paid say $50,000 a year then the cost to your organisation is probably almost twice that amount by the time they have paid for all the overheads associated with employing you. So if you work 40 hours a week and take 4 weeks holiday a year then you will cost your organisation around $50 an hour, or $400 a day for your effective hours - an inefficient use of this time is expensive for your organisation. There is also an opportunity cost, that is any inefficiently used time is not only a direct cost to the organisation resulting in reduced profits, but the time lost to the business could possibly be more effectively used on alternative revenue earning tasks, or simply just used on additional thinking time (reflection) to ensure more effective and innovative solutions to business problems. (This short paper on reflection and business efficiency was written in 2011 with two very innovative and effective colleagues). Organisations are constantly trying to improve their efficiency and if they are a people intensive business (they employ many people), then having their people make better use of their time is an immediate win in terms of higher profits (less cost per activity). However for the individual, making better use of their time will almost always reduce their day-to-day stress and will increase their well being, which is good for the individual and good for the organisation, a real win-win. It will also be an enabler to innovative problem solving, but more on that later. List all the tasks which need to be completed and then give each a priority (see below), action each item in their prioritised order. If any items have not been actioned by the end of the working day then carry these forward to the next day’s list. This simple but effective tool is described in Steve Covey's book; The Seven Habits of Highly Effective People. Randy Pausch explains how this should be used is his 2007 video. 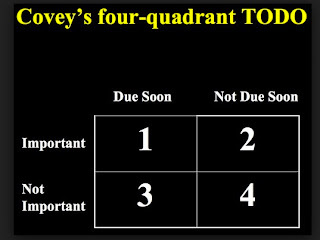 Remember that tasks in the 3rd quadrant will probably be left, but they are not important, you put them in the bottom left box! Tasks in the top right should be done immediately after those in the top left because very soon they will move into the top left. Again this stuff is obvious, until the pressure starts. We tend to forget that our brains are not infinitely powerful machines, we are not able to remember vast amounts of information and we are very poor at switching mental tasks. So the next two tips will reduce your load and allow you to use your mental power on the tasks you have prioritised. Don'y try to remember all your meetings and tasks - write them down (either on paper or electronically) and add details of 'what, when and why', then you won't forget who you are seeing next Monday and why you are seeing them. In 2011 some colleagues and I wrote a paper; E-mail, task-switching, and productivity, which looked at this issue. I think this short paragraph sums up the issues; "We can fool ourselves into thinking we are being more productive by constantly switching tasks, for example regularly reading and answering e-mail while simultaneously undertaking a possibly more intellectually demanding task such as report writing or attending a virtual meeting. However, our research has indicated that for the majority of people, that feeling of productivity is an illusion masking an actual deterioration of both work rate and quality". Again Randy Pausch sums up how having too many e-mails in your inbox can impact both you and your family, his talk on this is here. He says simply; "I sleep better when my inbox is empty". Managing when you look at your e-mail and how you manage your inbox is critical to a good work life balance and balancing how much time you spend on work in our modern world of "always on communications", can be difficult. 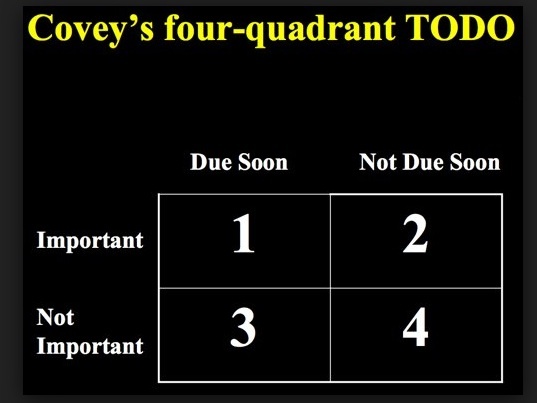 We all know how time just disappears when dealing with e-mail, so set aside some time and use the Covey strategy - only work on the important e-mails, file the others for action later, if ever (if they end up in the lower quadrants they are not important and may not require action, but if filed you can find them later). In this recent Guardian article - Danish entrepreneur Martin Bjergegaard says that to succeed and be happy it's not necessary to work extra-long hours that don't allow family time. He says; "These things are possible, but you have to organise yourself and the job you have. It won't happen if you don't try to make it happen. It's a responsibility to design your ideal life and go off and live it and not let anything push you away from that." A philosophy which is laudable and a good goal. My four tips are simple but, you will find, remarkably effective. However there is one last thing to remember, it is not a tool more a philosophy, learn to say NO. Even when you are very busy there is always the temptation to think that you can do just one more thing, especially if a friend or colleague asks. The right strategy is I'm afraid to say no, as a task rushed or left to the last minute will not be done well, contrary to popular notions. There is a myth which has grown up around the phrase; "we all work well under pressure", a recent study (2009) in the International Journal of Innovation and Learning, provides a detailed picture which indicates that the longer term effects of this approach are far from positive. Like all myths there is some truth in the phrase and for occasional tasks the additional pressure of a time deadline can focus the mind but the benefits gained in the short term MUST be balanced against longer term problems especially in teams. From the study; "Firstly mental workload may have a positive effect on productivity in the short term, but a negative effect in the long term. Second, mental workload leads to delayed mental fatigue, which has a negative effect on quality and productivity in the long term. Finally, mental fatigue decreases work engagement, thus having a negative effect on the innovativeness of a design group". If your work involves being innovative, then the failure to manage your time will seriously impact your effectiveness in the longer term. I afraid that Time Management has become an over used and sometimes misused management phrase but hopefully you will see that managing your time simply but effectively is good for you and good for your business.